Karl Taylor Compton, 1887-1954, B.S. 1908, M.S. 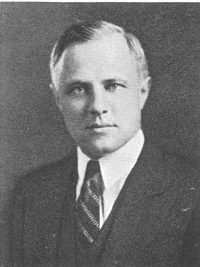 1909, College of Wooster; Ph.D. in physics, 1912, Princeton University, was president of the Massachusetts Institute of Technology from 1930 to 1948, then chairman of the Corporation until his death in 1954. He taught physics at Reed College, then at Princeton University, where he also was director of research at the Palmer Laboratory and chairman of the Physics Department. His areas of research included the passage of photoelectrons through metals, ionization and the motion of electrons in gases, the phenomena of fluorescence, the theory of the electric arc, and collisions of electrons and atoms. In World War I he was assigned to the American Embassy in Paris as an associate scientific attache. At MIT Compton transformed both the administrative and academic structure, strengthened the scientific curriculum, and developed a new approach to education in science and engineering. He served as chairman of the Section of Physics of the National Academy of Sciences, 1927-1930, and in 1930 helped organize the American Institute of Physics. In 1933 President Roosevelt asked Compton to chair the new Scientific Advisory Board. When the National Defense Research Committee was formed in 1940, Compton became chief of Division D (detection: radar, fire control, etc.) and in 1941 was placed in charge of those divisions concerned with radar within the new Office of Scientific Research and Development (OSRD). From 1943 to 1945 he was chief of the Office of Field Services of OSRD and scientific advisor to General MacArthur. After the Japanese surrender, Compton went to Japan as part of the Scientific Intelligence Mission. In 1948 he was appointed by President Truman to head the Research and Development Board, formed to oversee scientific preparedness in the postwar period.